Zero-emission hydrogen fuel cell systems soon could be powering the forklifts used in warehouses and other industrial settings at lower costs and with faster refueling times than ever before, courtesy of a partnership between Sandia National Laboratories and Hawaii Hydrogen Carriers (HHC). The goal of the project is to design a solid-state hydrogen storage system that can refuel at low pressure four to five times faster than it takes to charge a battery-powered forklift, giving hydrogen a competitive advantage over batteries for a big slice of the clean forklift market. The entire U.S. forklift market was nearly $33 billion in 2013, according to Pell Research. "Once you understand how these forklifts operate, the fuel cell advantage is clear," said Sandia's project manager Joe Pratt. Refueling hydrogen fuel cell powered forklifts takes less than three minutes compared to the hours of recharging needed for battery-powered forklifts, Pratt said. Consequently, fuel cell-powered forklifts are able to operate continuously for eight or more hours between fills. Currently, companies using battery-powered forklifts need to purchase three battery packs for each forklift to ensure continuous operation. They also need to set aside warehouse space for battery recharging. Sandia has worked with the fuel cell forklift industry for several years to help get clean, efficient and cost effective fuel cell systems to market faster. Standards developed by Sandia soon will be published so industry can develop new, high-performing hydrogen fuel systems for industrial trucks. Intrigued by the potential benefits of fuel cells over the electric batteries that now power most forklifts, HHC obtained a grant from the Energy Department's Office of Energy Efficiency and Renewable Energy and asked Pratt to help improve the design of a hydrogen storage system for fuel cells. Pratt has spearheaded other Sandia efforts to introduce hydrogen systems into the marketplace. He served as technical lead, for instance, for studies on the use of fuel cells to power construction equipment, personal electronic devices, auxiliary equipment and portable generators. Most recently, he led a study and subsequent demonstration project on commercial use of hydrogen fuel cells to provide power at ports. For its part, HHC is developing technologies for the fuel cell forklift market and expects cost reductions and performance improvements that will help the market grow. The company is developing a low-pressure hydrogen storage system that can be refueled at standard industrial gas pressures. That should reduce fuel system cost and expand the market to facilities that can't accommodate conventional high-pressure fueling systems. To solidify the forklift collaboration, HHC sent Adrian Narvaez to Sandia's Combustion Research Facility in California for several months. "Joe and I work together every day on the design, so it's a huge advantage to be able to work on site at Sandia," said Narvaez. Pratt said: "If hydrogen refueling is short enough to occur during normal downtimes, such as during operator breaks, then a single hydrogen forklift can do the work of three battery packs over the course of 24 hours. That translates into a direct cost savings." Today's hydrogen storage units require high pressure (5,000 pounds per square inch, or psi) to achieve a short refueling time—and high pressure refueling requires an on-site compression system. "That can be a big expense, especially for a small company," Narvaez explained. "If we can provide a storage system that meets the target refueling time at, say, 500 psi, companies can get a break in the up-front costs. Plus, they no longer have to purchase battery rechargers or dedicate space for recharging. Instead, companies can simply purchase and store hydrogen tanks as needed." Designing a storage system that meets HHC's specifications and can be integrated into a fuel cell power pack required overcoming some key challenges. Among these are identifying optimal metal hydride materials, determining an optimal shape and size for the storage tank and ensuring thermal management to achieve and maintain the temperatures required for fast refueling and supply of the hydrogen. Work to identify the right metal hydride for the system focused on Hy-Stor 208, a misch metal-nickel-aluminum alloy that meets targets for hydrogen storage capacity, density and thermal conductivity. The material also provides sufficient hydrogen pressure for refueling at an operating temperature of 60 degrees Celsius. While this type of metal hydride is heavy, the weight acts as needed ballast and thus is a benefit in forklifts. To increase thermal conductivity, the team also explored adding to the metal hydride two forms of expanded natural graphite, flakes and so-called "worms" because of their tubular shape. Pratt and Narvaez drew on modeling and simulation results from an earlier project led by Sandia engineer Terry Johnson to identify a small-diameter tube as the best design for storing the metal hydride. They then varied several tube characteristics, such as the hydrogen distribution channel and the amount and type of thermal enhancement material used. Next, they conducted experiments to evaluate the effects of these variations on a range of performance parameters, including hydrogen storage capability, refill time, durability, discharge ability and residual capacity at a minimum discharge point. "As the models predicted, we saw only minor differences in performance when we varied the graphite types. 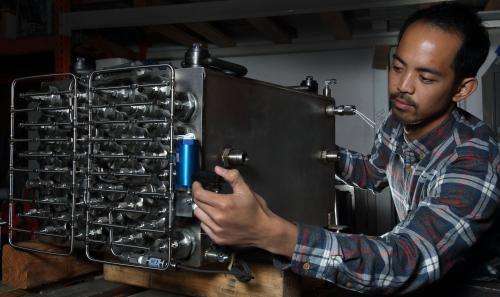 Likewise, the presence or absence of the hydrogen distribution channel had little effect on performance," said Narvaez. "These findings show that this application is not aggressively pushing the performance of the metal hydride storage to the point where these variations would make a difference. In fact, this is good, because it means we can use the lowest-cost solution and still expect good performance." Using findings from their experiments, Pratt and Narvaez developed an optimized storage-system design. During this time, the team also began to conceive of a tube array that would allow efficient thermal management (via water flows around the tubes). With Sandia's and HHC's design complete, project activity will transfer to Hawaii, where HHC will produce the first prototype metal hydride storage system. HHC will work with Canadian fuel-cell company Hydrogenics, which will integrate the new storage system into its proton exchange membrane (PEM) fuel cell power pack, designed to fit into a forklift. "DOE catalyzed the market for fuel cell forklifts, using industry cost-sharing to deploy more than 500 units through the American Reinvestment and Recovery Act," said Pratt. "The private sector recognized the advantages of fuel cell forklifts and deployed more than 5,000 additional units since then without government funding. If successful, the HHC project will lead to lower cost, improved-performance fuel cell forklift systems that will lead to even greater market growth."